32% of all global patents for blockchain technology were filed by Chinese businesses last year, with 99 patents from a total of 314 filed with the World Intellectual Property Organisation (WIPO) in 2017, shows a new study by UHY, the international accounting and consultancy network. The study shows that US businesses are close behind with 92 global patents (29%), followed by Australian businesses with 40 patents (13%). 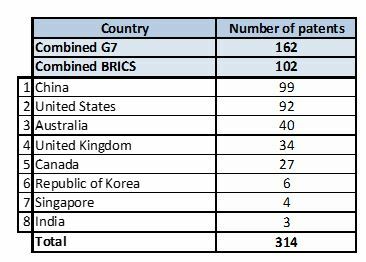 UK businesses filed 34 patents related to blockchain (11%) with WIPO in 2017 (see table below). UHY says that Chinese businesses have invested heavily in blockchain technology in recent years, with the Chinese central bank supporting the development of a blockchain-based trade finance platform to help SMEs access finance. Bank of China also announced in August 2018 that investment in technology, including blockchain, would be 1% of the bank’s annual operating income. UHY explains that while European businesses have only filed a limited number of patents at the global level through WIPO, many have been more active at a local level. For example, while German businesses have filed no patents for blockchain technologies with WIPO in the last year, there have been six filed with the DPMA, the German Patent and Trademark Office. The study also shows that Chinese businesses lead the way in the development of Artificial Intelligence (AI) technology, filing 473 from a total of 649 AI patents (31%) with WIPO last year. China is ahead of its global competitors by some distance in the race to build portfolios of intellectual property in AI. Its closest competitor is the United States, which filed 65 AI patents with WIPO last year (10% of the total). 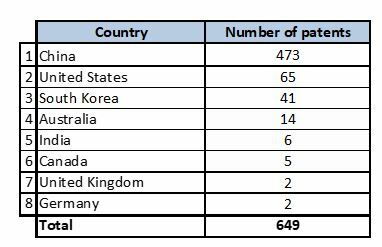 Only two global patents for AI technology were filed in the UK in 2017 (see table below). UHY says that Chinese businesses like Baidu – often described as the ‘Google of China’ – and technology and social media conglomerate Tencent are among the world’s leading developers of AI technology. Baidu filed the most AI patents at WIPO in 2017, with 183. In October 2018, Baidu launched an AI-powered translation tool which can translate spoken English into Chinese or German almost instantly. It also recently launched an AI-themed park in Beijing, which features self-driving buses and ‘smart walkways’ which track users’ exercise performance through facial recognition. The United States’ largest filer of AI patents with WIPO in 2017 was Berkeley-based startup Bonsai AI with seven. Microsoft announced its acquisition of the business in June 2018. Global competition over AI technology has heated up in recent years, with many national governments putting in place programmes to support businesses and universities in developing AI clusters and bringing technology to market. For example, Canada has introduced the CAD125 million Pan-Canadian Artificial Intelligence Strategy, which aims to increase the number of AI researchers in Canada, and develop AI clusters in Toronto, Montreal and Edmonton. In the US, the Trump administration announced in its 2019 Budget Request that artificial intelligence and autonomous and unmanned systems were Administration R&D priorities.